(York, Pa., March 7, 2018) - The York Revolution continue to build the 2018 roster, announcing the return of power-hitter Michael Burgess and left handed pitcher Luke Westphal and the acquisition of right-handed pitcher Zac Treece. The signings were unveiled by manager Mark Mason live on Tuesday night’s episode of “Revs Hot Stove Weekly presented by Shipley Energy” on SportsRadio 1350 WOYK. Burgess begins his third season in York, coming off a 2017 championship season that saw him represent the Revolution at the Atlantic League All-Star Game. Playing primarily first base and designated hitter with time in the outfield mixed in, Burgess batted .264 with 17 home runs, tied for second most on the team, and 66 RBI in 117 games. The left-handed batter added two more long balls during the team’s championship run in the postseason, including a two-run blast in the Freedom Division Series clincher at Southern Maryland. 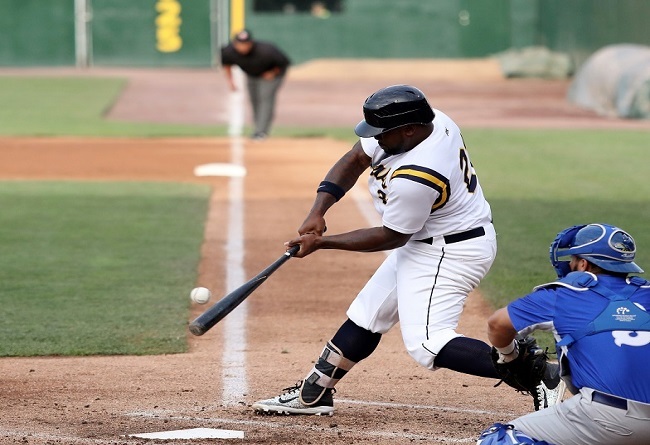 Burgess first signed with York early in the 2016 season, batting .275 with eight home runs and 31 RBI in just 43 games, and enters his fourth season in the Atlantic League. The 29-year-old Tampa native originally signed with Somerset, where he belted 15 home runs in 2015, helping lead the Patriots to a league championship. Drafted 49th overall out of high school by the Washington Nationals in 2007, Burgess has reached the Double-A level with the Nationals, Cubs, Astros, and Orioles organizations and owns 162 home runs and 675 RBI in his pro career. Westphal returns following a dependable season out of the Revolution bullpen in 2017. The hard-throwing southpaw posted a 3.35 ERA in 45 outings as a setup man, while striking out 64 in just 45.2 innings and allowing only 44 hits and 18 walks. He was dominant in the postseason, allowing just one hit and no walks while striking out five in 2.1 shutout innings over three outings. The 28-year-old began his career in the Frontier League in 2013 and 2014, before signing as a free agent with the Minnesota Twins to begin the 2015 campaign. Westphal made it as high as Double-A with the Twins in two seasons in the Minnesota farm system. For his career, the Clintonville, WI native owns a 3.19 ERA in 157 appearances (19 starts) with 303 strikeouts in 265.1 innings. Treece comes to York after going 6-2 with a 3.83 ERA in 53 outings (one start) for Long Island in 2017, striking out 72 in 61.0 innings of work. The 28-year-old excelled in his first full Atlantic League season, after becoming a perennial All-Star in the Frontier League. Treece first landed with Long Island, where he tallied four scoreless outings during the 2016 playoffs, after being acquired from River City, where he ranked second in the Frontier League with 22 saves while rolling out a 1.86 ERA. The Arkansas native had also previously pitched for Gateway and Lake Erie of the Frontier League, earning All-Star selections in 2013, 2014, and 2016, as well as making an appearance with Gary of the American Association. He enters 2018 with a 25-13 career record, a 2.94 ERA, 34 saves and 390 strikeouts in 247 games (13 starts). The Revs now have 15 players under contract for the 2018 season, and will unveil additional signings on the next episode of “Revs Hot Stove Weekly presented by Shipley Energy” on Tuesday, March 13, at 6:30 p.m. immediately following “The Baltimore Baseball Show with Dan Connolly” on SportsRadio 1350 WOYK and www.woyk1350.com.